Looking for a condo with class? Our 1800 sq. ft Lazy Days is dressed top to bottom with luxury; granite counter tops, open floor plan in full kitchen, large sectional with queen sleeper sofa, large half-covered balcony, Roman Tub and walk-in shower in Master Suite, plus a resort-size outdoor pool that overlooks Cherokee Lake and German Creek Marina. It’s time to gather 12-14 friends and family and head to the lake for some lazy days at foothills of the Great Smoky Mountains! if you need a boat, ask us about renting one for the day. We rent all year long so you can play all year long. Events include: Shakin’ The Lake, Dandridge Arts Excursion, Scots-Irish Festival, Downtown Trick-Or-Treating, Christmas in Dandridge, and much more. Sleeping arrangement: 3 bedrooms and 1 sleeper sofa. There is a great view of Cherokee Lake and Mountains. If lazy days turn into lazy evening, the condo is equipped with Cable TV premium channels (there is a flatscreen TV in each bedroom and the living room. Bluff's Condominiums are gated too - ultimate privacy and beautiful landscaping! Take the elevator to this top floor, corner condo. Drives & Putts are popular in the Lakes region. There are over two dozen golf courses and they are less than an hour's drive: Dandridge Golf & Country Club, Bent Creek Golf Resort and Laurel Valley Golf Course are great courses to spend a lazy afternoon. Bring your boat or jetskiis! We have lots of parking for trailers and the Marina is a short walk away. The Cherokee Reservoir has 400 miles of shoreline to fish and explore. If your boots were make for hiking and biking, then head to Panther Creek State Park and tour 17 hiking and biking trails, or try the Buffalo Trail. Bring your fishing gear! 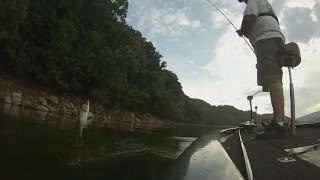 Largemouth bass, lunker smallmouth bass, black crappie, Walleye, Paddlefish are common in this east Tennessee reservoir. Here’s our pro-angler tip: Fish March and April for largemouth bass:) and National Fishing and Boating Week is June 2-9, 2018. 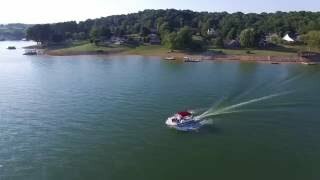 Since you plan and book directly with us at Smoky Mountain Lake, we can tell you all about the eastern Tennessee area and help you find things to do in Cherokee Lake country! We are only 10 minutes from Morristown, Tn. Of course, the list of activities in nearby Sevierville, Pigeon Forge and Gatlinburg are endless too: Ober Gatlinburg Ski Resort & Amusement Park, Ripley's Aquarium of the Smokies, Space Needle, Hard Rock Cafe, Star Cars Museum, Elvis Museum, Dixie Stampede Dinner & Show, Eagles Landing Golf Club, Forbidden Caverns, Horseback Tours. Boat all day! See if you can find all 18 islands and 8 bridges. During summer from June 1 through Labor Day the lake level is best. $110/night to $185/night. 3-night minimum stay. A damage deposit of $40 is required for reservation, as well as a refundable pet deposit.